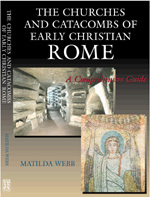 In the best tradition of well-researched archaeological guides, this volume offers a brief history, a diagram, and description of all the early Christian churches and catacombs as well as suggested itineraries… Recommended not only for the traveller but also for libraries as a good entrée into the early Christian archaeology of Rome. The early churches and catacombs of early Christian Rome not only comprise a material heart for the world’s Christians but are a quintessential heritage for modern Europe. They deserve to be far better known and this should be the book to do the job. This book will delight anyone, be they archaeologist or holiday maker, who loves Rome, its people and their historical treasures. With clear, no-nonsense descriptions, useful plans and a range of other valuable information, the author makes it possible for the interested traveller to tour the city’s churches and find an intimate peace alongside serene beauty. In so doing, Webb has written a book for the modern traveller to rival the medieval guides that pilgrims from all over Europe took on their journey of a lifetime. A very welcome addition to the literature. Brings together an immense body of learning. An admirably informative and practical guidebook.